Our 2019 season is finally here, and the club is delighted to announce our 2019 partners. MotorsportSales.com.au – we are welcoming back Karl and the team to take over the whole category. 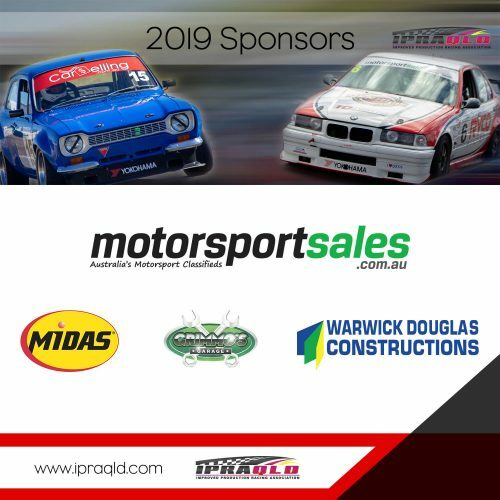 MotorsportSales.com.au will be the windscreen banner for under and over 2-litre in 2019. Midas Auto Service Experts – will take over the sticker above your door numbers. Midas has come on board to support the series in 2019 after supporting Improved Production at the Clipsal events previously. Warwick Douglas Constructions: most of you will know/have seen Warwick around the paddock in his purple BMW. Warwick is supporting the club this year and decided to partner with us to sponsor the number plate section of your cars – both front and rear. Grimmo’s Garage – Jason has also decided to support the club with sponsorship this year claiming the rear windscreen of your car. A previous series champion in QLD, it’s great to have Grimmo on board! Make sure you all thank these drivers and businesses throughout the year when you get a chance and make sure you like their Facebook pages (social media) and support them by using their services!